NEW YORK (TheStreet) -- AK Steel Holding (AKS - Get Report), Cloud Peak Energy (CLD - Get Report) and Steel Dynamics (STLD - Get Report) gained last week, while Agnico-Eagle Mines (AEM and Silver Standard Resources (SSRI were among the losers. AK Steel Holding emerged the top gainer last week, jumping 7.0% after it was upgraded to neutral from sell at Goldman Sachs. Cloud Peak Energy rose 6.3%. During the week, the company announced production data for its Cordero Rojo mine for the third quarter of 2011 of approximately 9.9 million short tons. Steel Dynamics grew 5.2% after it recorded an increase of 25% in its third-quarter net sales to $2 billion from $1.6 billion in the year-ago quarter. Meanwhile, net income increased to $43 million, or 19 cents per diluted share, from $19 million, or 9 cents per diluted share, in the same quarter a year before. Steel shipments were up 12% for the quarter. North American Palladium ( PAL and Haynes International ( HAYN - Get Report) gained 4.7% and 4.2%, respectively. Schnitzer Steel Industries ( SCHN moved up 2.8% after the company reported double-digit revenue growth and higher volumes and prices. Net profit for the fourth quarter increased to $36.7 million, or $1.31 per share, from $17.4 million, or 62 cents per share, in the year-ago quarter. Revenue for the quarter increased 10.2% to $1.08 billion. For the first quarter of 2012, SCHN expects revenue to increase 20% to 30% from 2011 first-quarter levels. 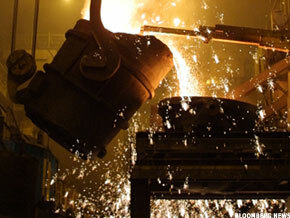 Nucor ( NUE rose 2.6% after the company reported positive third-quarter 2011 earnings. Net sales increased 27% to $5.25 billion from the year-ago quarter. Net income increased to $181.5 million, or 57 cents per diluted share, from $23.5 million, or 7 cents per diluted share, in the third quarter of 2010. Gold and silver prices were down 1.7% and 1.3%, respectively, to $1,642.38 per ounce and $31.39 per ounce last week. Gold-producing companies Agnico-Eagle Mines and Gold Reserve ( GRZ were at the top of the losers' list, plunging 26% and 16.2%, respectively. Silver producers Silver Standard Resources and Endeavour Silver ( EXK dipped 11% and 10.8%, respectively. Alumina ( AWC lost 10.3% last week. Vale ( VALE shed 8.2% on concerns regarding price reductions for iron-ore used in steel making. Golden Star Resources ( GSS dropped 8.8% last week after Zacks Investment Research downgraded the stock's rating to underperform from neutral. Patriot Coal ( PCX lost 8.0% last week, while Cliffs Natural Resources ( CLF fell 7.9%. Yanzhou Coal Mining ( YZC fell 7.9% last week after its third-quarter profit decreased 70% to $172 million from the year-ago quarter.